First things first. You need to start this tutorial with a damp head of hair and a few spin pins . 1 - Gather your damp hair with your hands. 2 - Twist your hair. 3 - Wrap into a bun on top of your head and pin in place (do not use hair ties). 4 - Go to bed. 5 - Wake up & unwind your hair. 6 - Take 5 minutes to curl stray pieces, smooth, and spray with hairspray. 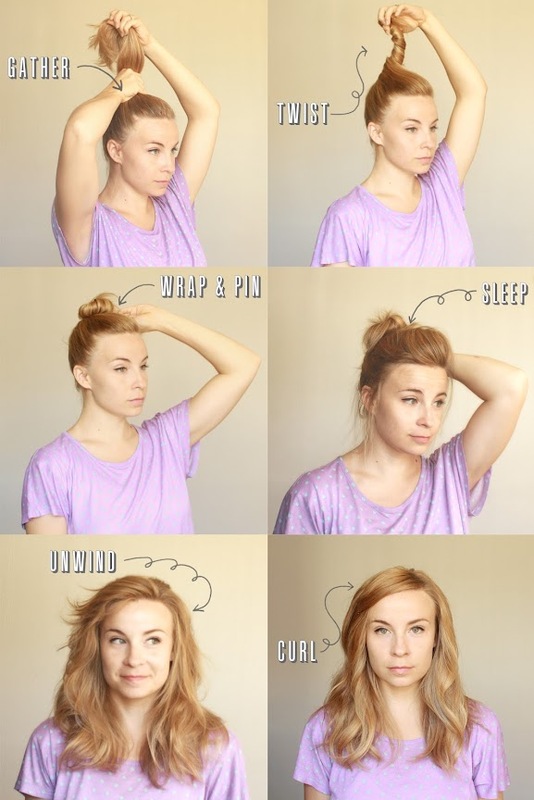 I love doing this with my hair because I can wake up with hair that is almost ready for the day, it's actually comfortable to sleep in, and it gives me a lot of extra volume. It actually even looks cute int he picture where you unwind it. I don't know if you would ever walk around like that, but I think you should. Cute! I'm definitely going to try this. How damp do you keep your hair when you put it up? I feel like I put it up and it's always too wet! I would say just barely damp, almost dry. If it's too wet, it won't dry while in the bun. THis looks so easy! Love this, thanks girl. Looks great. Let's see if I can get my hair to look that good. Also, I am loving that shirt! Where's that from? It looks soooo comfy! I got it at Forever 21 a few months ago, and you are so right, it's comfy! I might have to get some spin pins and try this with my hair. Looks good! Random....I'm getting my hair cut this weekend and I want your cut (your hair is SO pretty!). What should I ask for? That is so nice! Honestly, my hair is poorly maintained. I haven't had a cut in over a year. I would take in a picture of the hairstyle you like, that's always turned out best for me. Congratulations to you, with heaps of blessings too ! You look fantastic, and I didn't realize at first that the bangs were clip-in, how awesome is that ?